I read (and believe) this article that data entry tips in HTML placeholders are generally harmful and should be avoided. In-context descriptions or hints can help clarify what goes inside each form field, and therefore improve completion and conversion rates. There are many ways to provide hints...Unfortunately, user testing continually shows that placeholders in form fields often hurt usability more than help it. I'm starting to see placeholders being used for default values, and it seems this would be a better use for them. They would represent what the field will "do" if no value is entered, and are thus a literal placeholder for no value. The idea is that, while a placeholder hint disappears when the user most needs it (when they are interacting with the field) a placeholder default value disappears when the user has decided they don't want it. 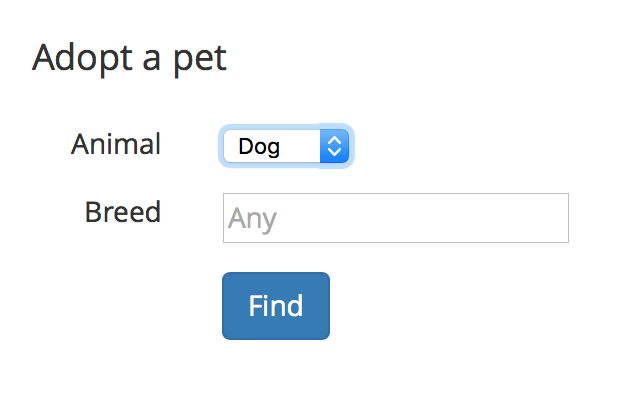 If you leave the breed field empty, this form will return all available dogs regardless of breed. The "Any" placeholder denotes that. NOTE: Please don't get hung up on "breed" - it could just as easily be "postal code" or anything else that accepts free-form entry. This question is about placeholders, not about when to use different kinds of input elements. Is there any analysis to back up/refute whether this is a good pratice? Does anyone have experience trying this? These placeholders typically function grammatically as nouns and can be used for people (e.g. John Doe, Jane Doe), objects (e.g. widget), locations ("Main Street"), or places (e.g. Anytown, USA). They share a property with pronouns, because their referents must be supplied by context; but, unlike a pronoun, they may be used with no referent—the important part of the communication is not the thing nominally referred to by the placeholder, but the context in which the placeholder occurs. If I understand correctly, placeholders are generic examples in a certain context. They might be real cases but I guess the more generic the better to understand it is an example. So Placeholders shouldn't substitute labels and shouldn't substitute extra information needed to complete the input. In your example it might be tricky to use a generic example as breed. A concrete case could work but the more specific the placeholder the more difficult it is to understand that it is supposed to be generic. It is useful if you want to reduce the amount of interactions but it is a bit more complex to understand. 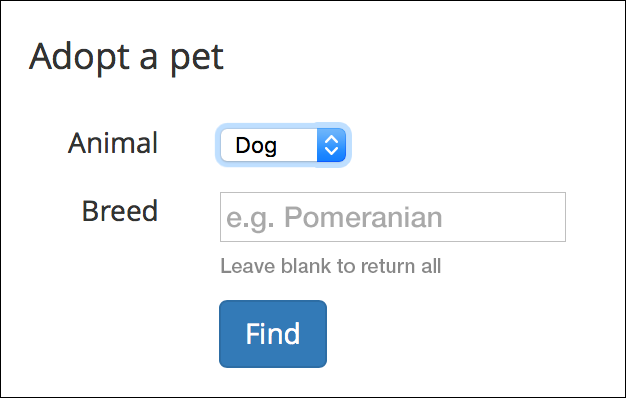 Also it is not working as a generic example as there is no "Any" breed. Generally I would stick to using placeholders as generic examples (one example, by the way). If its acting as a value then why not have it as a value? The placeholder text should be used to hint at the type of entry that is required. In your particular scenario I would either set the value attribute to Any instead of the placeholder attribute. Then if the user wants to change the value they can, else they leave it as Any and tap Select. Better still, set the placeholder attribute to something like e.g. Pomeranian instead to give better indication of the type of entry required. Then return all if the user leaves it blank or if they enter Any. Helper text near to the input saying something like Leave blank to return all would also be useful. Straight away I assumed Any wasn't a value I could leave there, however the form was insisting I enter Any value. Slightly misleading in my opinion. How about using a select, or a filtering select for these values and having Any as the default value instead? I understand there are many breeds of dogs, however - so this may not work too well either. Possibly just a label above this field saying "Leave blank to indicate any breed." perhaps? I actually agree with Tim's suggestion and think that using placeholders for default values makes total sense. 1) By using Tim's suggestion, the user can distinguish between fields the user has typed from values calculated by the application. Putting default values as input can work for some scenarios but for technical forms with lots of input, users want to know what is actually input and what is a default value provided by the app. 2) By using placeholders, the default value disappears when a value is provided, is a good metaphor for what a default value is (a preselected option adopted by a computer program or other mechanism when no alternative is specified by the user or programmer). 3) Quite often default values are internally assumed without the user knowing because there is no easy way to show in the UI all the default values that a form with several input fields can assume. This fixes this issue by providing with a consistent approach that doesn't take any real state of the form. Having read the article you referenced, Placeholders in Form Fields Are Harmful, while placeholders may not be actively harmful, they're at least not as useful as you think. And if it's not helpful, why do it? From an accessiblity (and an "avoiding litigation") standpoint, placeholders are often omitted by screen readers: W3.org Tutorials: Accessibility for forms. If it's an element that's likely to be skipped, then you wouldn't want to provide essential/useful information there. And if it doesn't serve an essential, useful purpose, why have it cluttering up the UI at all? If I make no choice in a filtering field, I would expect that my results would include everything - searching for "washing machines" on an appliance store site where I don't specify a brand should give me washing machines they sell, regardless of brand. I don't need a placeholder to tell me "this is everything." Not the answer you're looking for? Browse other questions tagged forms html5 placeholder or ask your own question. Best ios alternative for an html select box?